The PhysiX and the Crux Prime have more in common than one might think - performance being one of the lesser accords. Let's take a trip down Memory Lane and see how their genealogy relates, shall we? The PhysiX features a coverstock that has never been introduced to the United States until now, and a core that the world has yet to see: the Atomic Core. At first glance, the Atomic Core automatically connects itself to the Storm brand. There’s no doubt where this shape came from! But it’s not all pizzazz. The inlets surrounding the classic Oval Bolt actually do serve a purpose. They form very large RG bands the ball doesn’t want to deviate away from as its rolling towards the pins. This creates a ball motion that is tough for 35 pounds worth of bowling pins to exact their will upon. NRG Hybrid has never been put on a catalogue featured, domestically released ball. So it’s fitting that it is featured on a shape that very well may be the most iconic design to ever leave Brigham City, Utah. We’ll admit, behind the scenes, we were indecisive as to what cover we were going to wrap the Atomic Core in when it was time to unveil it to the public. I mean, when you have so many good ones at your disposal, it makes it kind of hard to decide! We don't develop balls just to develop balls; each one has a specific purpose with a design intent. So during the time of development, Bowl Expo 2018 was just around the corner in Las Vegas, Nevada. We decided to take the top three coverstock contenders that could potentially marry with the Atomic Core and let the public decide this ball’s fate. Keeping the core a secret, NRG Hybrid was the eventual winner based on the feedback we received from the public testing and the PhysiX became so. What were the other two test covers, you ask? One was R2S and the other that came in second place by photo finish is what we refer to as “SPEC” today. 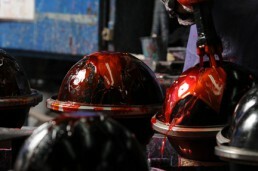 Believe me when I say we are always testing experimental shapes and fascinating covers here at the bowling ball factory. The Catalyst Core was a design that the masses were demanding to be brought back and what better way to do it than with an all-new cover! The vertical cavity that’s nestled in the center mass of the Catalyst shape acts as a deliberately-placed balance hole which is very user-friendly when you’re able to drill into it and not affect its dimensions too much. The Crux Prime has all the ingredients of a dangerous weapon from the baseline. The chemistry behind SPEC is enough to warrant its own full-length seminar, so we won’t dive too hard into the details here. But it is important to note that this material grips the lane unlike anything that has ever left the Utah plant. In a nutshell, the innate Ra of SPEC is slightly higher than our other primary coverstocks that don’t use an ancillary additive or enhancer. Chemical friction, surface roughness, and COF’s are commonalities in the bowling game we know today. 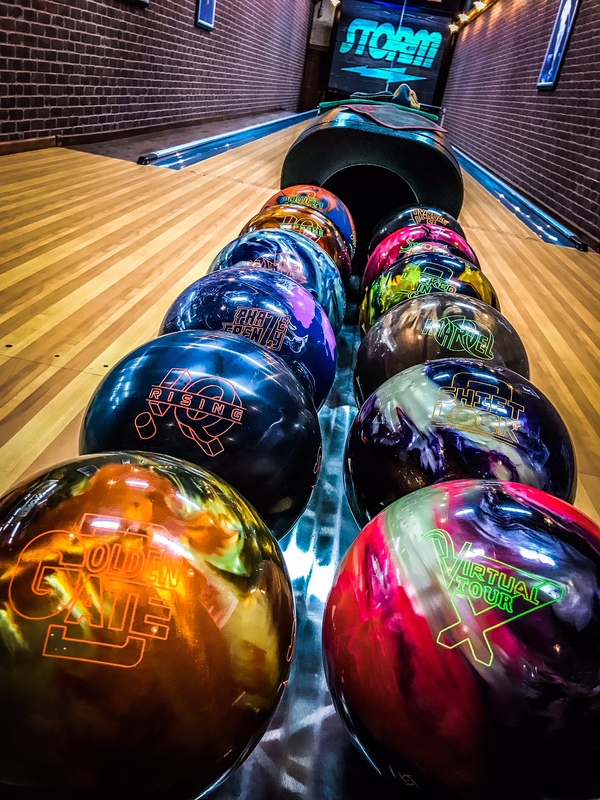 But there is another component to bowling ball development and performance that ties in directly to the endless tapestry that is ball motion: chemical tackiness. For instance, a pearl/polished ball has a very high dry lane coefficient of friction. A ball like this is extremely tacky when it encounters arid lane material. Put this ball on oil, and its COF becomes almost nil. SPEC material, however, creates virtually the same adherence on dry lane material at any given surface. This extra “cling” the ball produces gives the wielder added bearing and control especially when needing to get the ball to shape properly after moving in deep with heftier launch angles. The result is sustained entry angle into the pins and prevention of the ball migrating forward too quickly (rolling out). For lack of a better term, this “cohesion factor” the Crux Prime creates when it touches the lane largely makes up for the decline in surface profile which results in a minimal loss in backend reaction over time. Now that these balls have names and directions, it’s time to dive into the nitty-gritty an expose as many details as we can about the Crux Prime and PhysiX. The layout chosen for these two balls was 5x3x2. As always, Storm’s VLS system is an original conception and is the only layout system in the industry that takes the shape of the weight block into account. For this study, I decided to use Kegel's 4:1 Beaten Path. I knew this pattern would showcase the differences between these two balls exceptionally well. 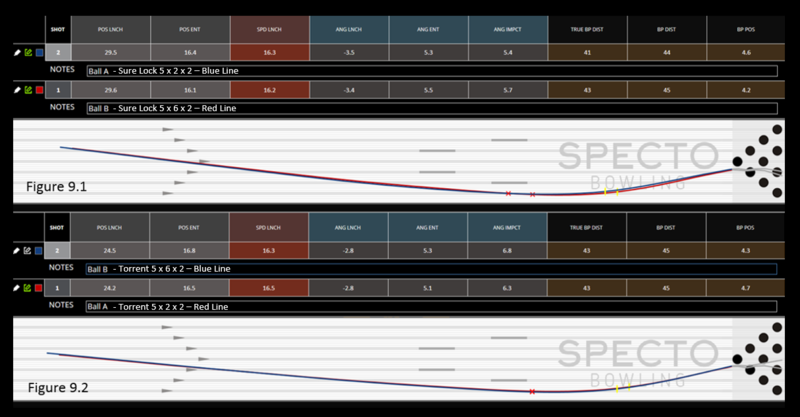 I tossed 30 shots on SPECTO with each ball, averaged the results, and created composite motion paths for each along with a comparison chart utilizing the hard data SPECTO provided. Both balls were resurfaced prior to the test using a Storm Surface Factory machine with fresh Abralon pads for each to achieve the most consistent finish possible. The Crux Prime breathes new life into the Premier line with the never-before-seen SPEC coverstock. There were some palpable differences between the Crux Prime and the PhysiX that challenges the conventional way we think some of these chemical formulas behave. I found this the case both objectively and subjectively. Let's refer to the former, shown below. Solids are widely accepted as balls that require heavier volumes to perform as intended, comparatively to pearls and hybrids. The Crux Prime naturally settled me about 5 boards deeper than the PhysiX, but the interesting part was what happened on the backend. At over a degree more entry angle at the point of impact, the Crux Prime left me astonished time and again. This really came in handy when I started to see the ball checking a little early and I crept inside to find my easy float through the fronts once again. This doesn't make the PhysiX a bad ball or under-performer by any means, there's a time a place for each and every ball. NRG Hybrid has an innate chemical friction built into its substructure thanks to the Nano additive we utilize in it. This makes the ball want to lose its axis rotation fairly quickly (higher rev rates only amplify this) so the PhysiX set down point was always just outside the Crux Prime for me. With its earlier breakpoint, the PhysiX at 1000 or 2000-grit would be enough to tackle the heaviest of the heavy that I would ever see here in Northern Utah. The chemical adhesion (mentioned earlier) the Crux Prime creates to the lane is observable and very much welcomed. Its able to maintain its mid-lane read with no shortfall of entry angle. We all look for that "unicorn" reaction where the ball is clean through the fronts, strong mid-lane, great continuation through the deck, and hits like a truck. If you are reading this and you've found the prodigal ball that does it all, please drop me a line because I will pay dearly for it. If there was ever a ball I've rolled that does it all and then some, this is as close to that fabled reaction I've ever seen. The tackiness it seemed to produce when it encountered dry lane kept the ball from jerking too hard off the spot. "Controllable angle" sounds like an oxymoron, but the Crux Prime provides it with ease. I can't wait to see how this coverstock performs on future cores - symmetrical and asymmetrical alike. True to its heritage, the Crux Prime continues to impress me every time I pick it up. When I needed to be aggressive and step in to sling the ball farther out, I could tap into the Catalyst Core's power potential with as little effort as moving up 6" on the approach. I also liked the response of the cover when I was looking for friction up front. I felt accurate with the Crux Prime in my hands, and I was confident from multiple angles. Overall maneuverability was excellent, which made it very easy to get my swing into position and free up my grip. 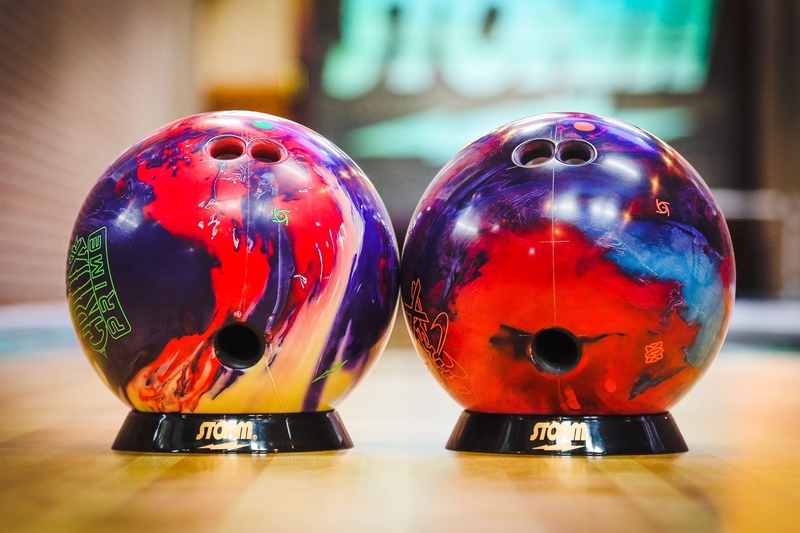 The out of box 2000-grit surface demands a pretty slick environment to thrive on, so taking it up to 3000-grit for this test was a good decision as I see myself being able to use it on a wider variety of conditions and in different bowling centers. There was enough of a difference between the PhysiX and Crux Prime for me that I would justify reserving a spot for each in my bag when traveling to future tournaments. Storm has a full-time tech representative ready to answer any questions you have about the Crux Prime or any other Storm product. Please call (800) 369-4402 (Mon-Fri, 8am-5pm MST) or send an email to tech@stormbowling.com (anytime). Zach wasn’t the only one who felt “trapped” with the Timeless. Taking this into consideration, we went through many iterations of the intended design with the Drive while ultimately settling on an R2S/Nano blend that we cleverly titled: R2S Nano. Zach rolled each ball 20 times on Kegel's Beaten Path. We took SPECTO readings at the beginning, middle, and end to compare the results for each ball. Following his preemptive impressions, Zach started an arrow deeper due to the significantly stronger cover and surface prep. There was never any question the ball would miss the spot from too much length. After about 10 shots with each ball, Zach felt he should have moved more at this point. Every shot with the Drive was high flush, but a little too high sometimes tripping out the 4-9 several times. The Timeless was the ball Zach felt comfortable with at this point because it was not seeing the friction as severely as the Drive. SPECTO does a fantastic job of showing the difference in shape with both balls. The breakpoint distances are pretty tightly grouped even though the Drive is over an arrow deeper towards the end of this test. The Timeless needed a straighter trajectory with less launch angle to find the pocket. Overall, Zach preferred the shape and location he had to play with the Drive being inside the track of the Timeless with fresh oil instead of out in the dirt. Storm has a full-time tech representative ready to answer any questions you have about the Drive or any other Storm product. Please call (800) 369-4402 (Mon-Fri, 8am-5pm MST) or send an email to tech@stormbowling.com (anytime). The Centripetal HD Core delivers instant revs and puts the entire category on notice. We know that controlling the midlane is what the pros are renowned for. They are able to see ball motion in a way that lets them make the best decision in order to get their ball into a roll before the end of the pattern. Whether they do that with surface, speed, axis tilt, or core technology is dependent on the situation at hand, but believe me when I say having a ball in your hand that is trying to roll as soon as it hits the lanes certainly doesn’t hurt. Chris Barnes, who’s arguably the best technician on tour, told me years ago that he only uses low RG balls for this very reason. A ball that is rolling into the pins carries considerably better than a ball that is hooking into the pins. When a ball makes impact and doesn’t have a direction of motion that is in-line with the centers of gravity of the pins, some of the energy that would have been available for the post-collision pin velocity will be lost to rotation and friction. Because the Centripetal HD Core’s center of gravity is extremely low, it consistently impacts the pins at the perfect spot every time maximizing carry. Delving a little deeper into the physics behind it, angular momentum is much harder for an external force to change its direction as opposed to linear momentum. Angular momentum is essentially the rotational equivalent of linear momentum and remains constant unless acted upon by an external torque that’s proportional to the initial moment of inertia (the bowler’s release). The faster the angular momentum created, the more torque is required to cause a change in angular acceleration. Simply stated, we apply rotational energy to create angular momentum around the weight block of a bowling ball, AKA torque. This energy we impart on the ball stays the same until something else tries to stop it, like the friction on a lane or 40lbs worth of bowling pins. Cores like the Centripetal HD in the Son!Q that have lower RG values have a higher potential to conserve its angular momentum throughout the lane and into the pins. This results in less deflection, better carry, and higher scores. Getting into something that’s a tad more observable to the naked eye, the entry angle into the pocket that the Son!Q creates really wasn’t that steep. Especially when compared to something like a Hy-Road Pearl that’s at the other end of the spectrum when discussing RG values. Balls like the Hy-Road Pearl, at least for me and the way I roll it, really magnify both wet and dry circumstances which is probably why they only time I use the ball is when there is at least 2000-4000 surface on it. With the Son!Q, I noticed less wrapped 10-pin leaves, fewer stone-9’s, and much lower flight paths of the pins when the ball makes contact – which was optimal for carry in my many off-pocket hits because the pins are colliding with each other instead of flying above one another. On the rare occasion I left a stone-9, there was always a messenger there to greet it. For this test, I tossed 30 shots with each ball on a fresh Beaten Path pattern and took excerpts from each transition you can see below in the SPECTO results. Even just a 0.010 difference in the low RG versus the Marvel Pearl was enough to make the Son!Q breakpoint distance a couple feet sooner during my initial warm-up when getting lined up. But for this test, I wanted to show the best line to the pocket for both balls on the Beaten Path pattern by Kegel. Early on (fig.1), the Son!Q’s lay-down had to be about 3 boards inside of the Marvel Pearl. From slightly inside, the breakpoint distance was 1-2 feet later for the Son!Q, but it was also crossing more boards overall given the same speed and hand position I was using. As the lane started to transition (after about 12 shots) I moved the standard 2:1 and found no shortage of movement or carry with either ball. The Son!Q laydown remained just inside of the Marvel Pearl with the breakpoints inching closer to one another downlane (fig. 2). The R2S cover on the Son!Q was able to generate slightly more entry angle into the pocket due to its cleaner nature when compared to the R2X featured on the Marvel Pearl. After another 12 shots or so I moved another 2 left but kept my eyes the same. At this point, the breakpoint distance for both balls were well-nigh similar and the breakpoint boards were pretty close as well (fig. 3). The differences in the two balls, for me, shined through on the fresh. When the lane started to really break down, the spread between the two got closer with the additional friction that was happening in the fronts. If you already have a Marvel Pearl but are considering picking up a Son!Q, I would recommend another one of your favorite layouts or a simple surface change just to give yourself a little more diversity in your bag - unless a 3-5 board shift inside and a slightly more angular downlane transition is what you are looking for given equal layouts/surfaces. To date, the original Marvel Pearl @ 3000-grit Abralon was my favorite “on the fresh” ball. Now that the Son!Q has made its way into my hands, I will keep it at the original 1500-grit polished surface and use it to fill that transition gap I’ve been combating for such a long time and reintroduce my Marvel Pearl back to 3000-grit. Storm has a full-time tech representative ready to answer any questions you have about the Son!Q or any other Storm product. Please call (800) 369-4402 (Mon-Fri, 8am-5pm MST) or send an email to tech@stormbowling.com (anytime). 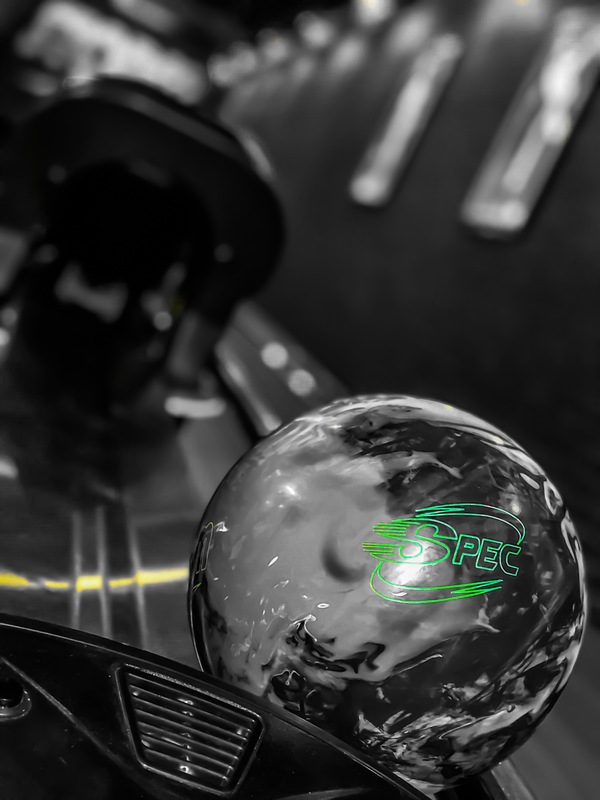 The preferred spin axis (PSA) on an asymmetrical ball is one of the most misunderstood topics surrounding bowling ball technology in today’s game. A majority of bowlers don’t realize how important it is and how much more the ball reaction can be fine-tuned when drilling an asymmetrical ball. 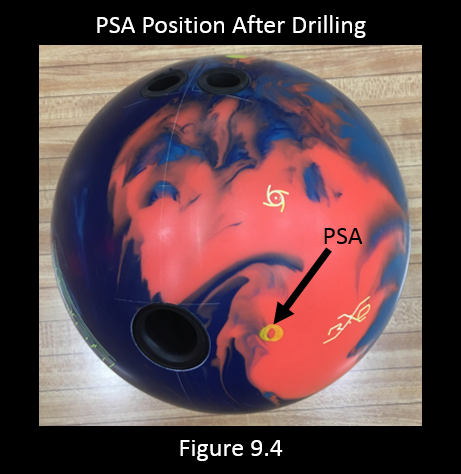 Before we dive into this topic, it is important that we understand what the PSA is, where it exists on a bowling ball, and why it is there. Let’s take a closer look. Take a look at Figure 1. It highlights the difference between a symmetrical ball and an asymmetrical ball. Looking at the Stinger™ 2.0 Core on the left, you’ll see that the core can be cut in half any direction through the pin and both sides will be identical. This is essentially the definition of radial symmetry, which the bowling industry calls "symmetric" for short. The Stinger 2.0 Core is a symmetrical core. Symmetrical cores are going to tend to transition slower and smoother than asymmetrical cores because of this evenness from side to side. Looking at the RAD-X™ Core on the right in Figure 1, you’ll notice that the same process of symmetrically cutting the core in half around the pin cannot be done. One side of the core is skinnier than the other side. This creates a preferred spin axis and makes the core asymmetrical in shape. Asymmetrical cores are going to tend to transition faster and change direction more violently than symmetrical cores. This is primarily because of the added amount of imbalance caused by the PSA. 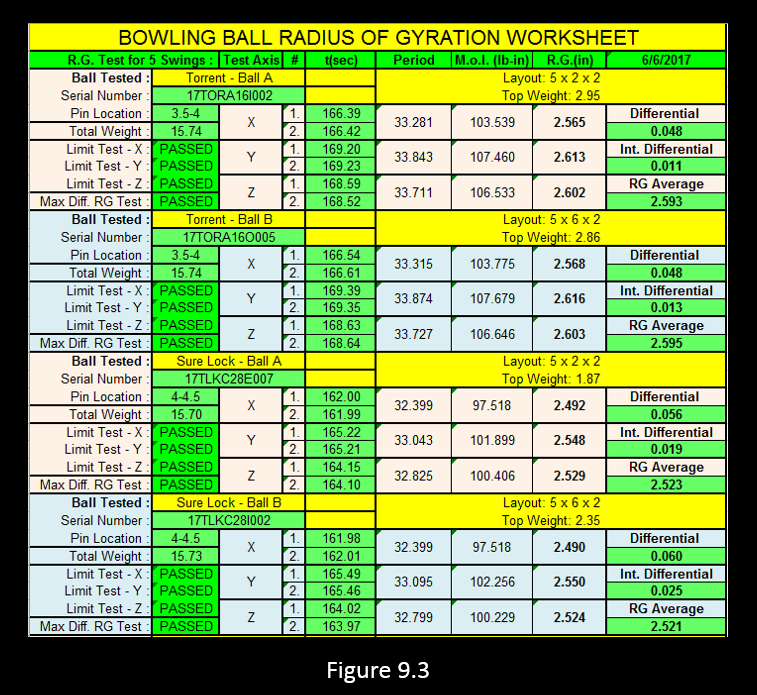 Radius of gyration (RG) and total differential are specs that are provided by manufacturers to help pro shops and consumers understand the core technology inside the bowling ball. Intermediate differential is another specification that is only listed on asymmetrical balls. Intermediate differential by definition is the difference between the y-axis and z-axis of the bowling ball. I know this can be a bit confusing, but bear with me for now. Look at Figure 2. You’ll see an image of three different bowling ball cores. 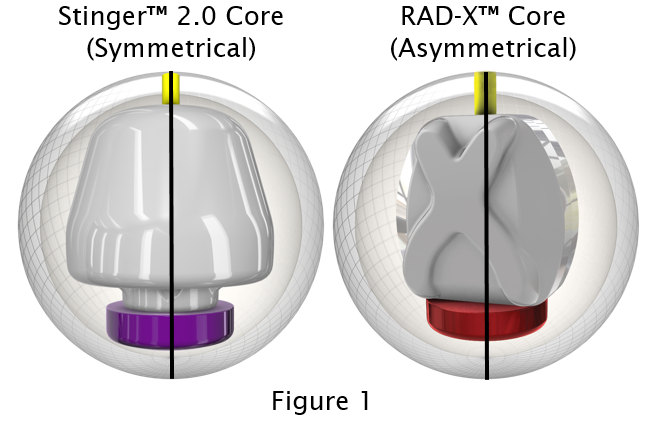 The first image is of the Stinger 2.0 Core, the second is of the RAD-X Core, and the third is of the G2™ Core. I've included the intermediate differential on each of the cores to help show their differences. Intermediate differential only exists on asymmetrical cores. It doesn't exist on a symmetrical core because the width of the core is the same all the way around the ball at 6 ¾” from the pin. In other words, there is no difference from the y-axis to the z-axis. Take a look at the Stinger Core. It is the same width all the way around making it symmetrical. This makes the intermediate differential 0.000, which is the primary reason that it is not listed with other manufacturer specifications. Next in line is the RAD-X Core. You’ll see that there is a moderate amount of intermediate differential because it is skinnier on one side of the core compared to the other side. The skinnier this side is in relation to the other, the more intermediate differential the ball is going to have. The intermediate differential of the RAD-X Core is 0.018. Finally, the G2 Core has the most intermediate differential of any ball that Storm has ever created at 0.028. The higher the number, the stronger the PSA is and the more influence it is going to have when placed in a strong position. It’s important to note that it is nearly impossible to see this with the naked eye. We are talking extremely small numbers, but they have a large effect on ball reaction. This is why it may be difficult to see that the G2 Core is skinnier than the RAD-X Core. Keep in mind this intermediate differential is only going to have an influence if it is placed in a strong position relative to the PAP. Placing it in a weaker position is going to reduce the impact it will have on ball reaction. These numbers are taken from 15lb bowling balls. Keep in mind core numbers can all change depending on what weight you throw. Be sure to make sure you're looking at the correct weight when looking at these numbers. Any time that there is the presence of a PSA, it is always going to be the preferred axis for the ball to rotate around when energy is applied to the ball. In other words, the ball will always orient itself and rotate around this axis because it is balanced in this position. The laws of physics dictate this happening. Depending on where the PSA is placed in relation to the bowler’s positive axis point, different reactions can occur. How much of a difference you might see in reaction depends on the amount of intermediate differential in the PSA. In other words, the intermediate differential is the indication of how strong the PSA is on the undrilled ball. The higher the intermediate differential, the stronger the PSA. There is not a strongly defined PSA on symmetrical balls because there isn't a significant amount of intermediate differential. Keep in mind all of the other variables of ball motion have an effect here as well. As I’ve stated in previous articles, we are simply taking a look at this one variable and holding all the others constant. Take a look at a few generalized examples below and see what they look like when put in motion. PSA-to-PAP distances of 4 ½” or more are going to result in the PSA being oriented closer to a stable position at the moment of release. Take a look at Figure 3. The picture shows the rotation of the core with the PSA placed 6 ¾” away from the PAP. This is an extreme example. You’ll see that this puts PSA in a stable position as the ball is released. This is going to reduce the overall track flare and cause the ball to transition slower as it travels down the lane. This is going to make the ball get through the front part of the lane cleaner, and be much smoother as it releases energy down lane. Keep in mind, these balls show 0 degrees of both axis tilt and axis rotation. They also show a Pin-to-PAP distance of 6 ¾”. I’ve chosen these because it makes the differences in PSA-to-PAP distance the easiest to see visually. Additionally, the balls do not have holes. When you add in tilt, rotation, layout, and size of the holes, the actual orientation can get extremely complicated to show visually. We are keeping these examples extremely simple so it’s easy to see the difference in orientation upon release. PSA-to-PAP distances of 2 ½” or less are once again going to result in the PSA being oriented in a more stable position at the moment of release. This is similar, but not to be confused with the longer distances. It is similar to Pin-to-PAP distances. When using shorter PSA-to-PAP distances, the PSA is going to line up extremely early on the lane as it is nearly lined up already at the moment of release just as a short Pin-to-PAP distance nearly balances the core at the moment of release. Take a look at Figure 4. The picture shows the rotation of the core with the PSA placed 0” away from the PAP. You’ll see when the ball is in rotation that the PSA is completely lined up at the moment of release. It doesn’t have to migrate to be in a stable position. A ball with a shorter PSA-to-PAP distance will want to line up quickly and stabilize early as the ball is traveling down the lane. As I mentioned at the end of the previous paragraph, PSA-to-PAP distance is relative to all of the other factors of ball motion. They all work together to create the desired ball motion. PSA-to-PAP distances longer than 2 ½” but shorter than 4 ½” are going to result in the PSA being oriented in a strong position at the moment of release. It will be in a very unstable position and it will want to migrate to a more stable position as it transitions down the lane. Take a look at Figure 5. The picture shows the rotation of the core with the PSA placed 3 ⅜” away from the PAP. You can see how unstable this is even with the Pin-to-PAP distance being 6 ¾". On a side note, this shows you why an asymmetrical ball will flare more with longer Pin-to-PAP distances if the PSA is placed in a strong position. There is still imbalance present in the PSA that wouldn't be present on a symmetrical ball. With a stronger PSA-to-PAP distance, the ball is going to transition quickly, flare more, and react stronger as it rolls down the lane. This is a great example to show you how intermediate differential affects the imbalance. The higher the intermediate differential is, the more effect it is going to have when placed in this unstable position. You can also see why it is only relevant when placed in a stronger position. In the previous two examples, the PSA begins in such a stable position that the intermediate differential is largely irrelevant. This is the same relationship as total differential and Pin-to-PAP distance. It doesn’t matter if the ball has 0.060 differential if the Pin-to-PAP distance is 0”. The core is balanced upon release and isn’t going to flare as it travels down the lane. Most players believe that changing the PSA-to-PAP distance on a symmetrical ball will create a significant difference in ball reaction. When changing the PSA-to-PAP distance on a symmetrical, all you are really doing is rotating changing the position of the center of gravity. 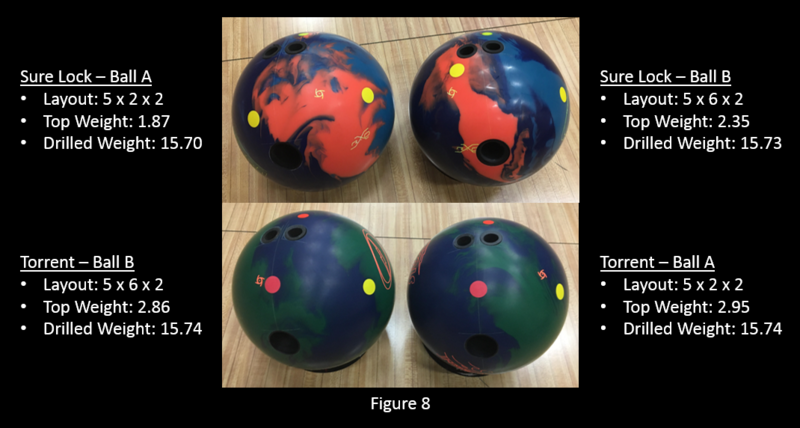 Figure 6 shows a classic example of two bowling balls with identical Pin-to-PAP distances and pin buffers. The only difference is the PSA-to-PAP distance. We have used a 2” PSA-to-PAP distance on the ball on the left and 6” PSA-to-PAP distance on the ball on the right. Before looking at the next figure, imagine what the difference in core position looks like. Now take a look at Figure 7.1. You’ll see that no matter how much we rotate the center of gravity, the position of the core stays in relatively the same overall position because the Pin-to-PAP and pin buffer distances have remained unchanged on the symmetrical. Imagine screwing an incandescent light bulb into a socket. No matter how much you rotate it, the orientation of the light bulb does not change because it is symmetrical in shape. In a bowling ball, the only difference you will see is in the static weights of the ball, which we already know from previous articles are not very influential to today’s ball motion. Take a look at Figure 7.2. You'll see that there is a difference in core position when rotating it because of the asymmetrical shape. The PSA moves a significant amount and can be placed in a certain position to manipulate ball reaction. Hopefully these visual aids really helps you see what difference there is when comparing the PSA-to-PAP distance on a symmetrical to an asymmetrical. I’ve provided some data using Specto by Kegel® to visually help you see the difference of changing the PSA-to-PAP distance in a symmetrical compared to an asymmetrical. There were a total of 4 balls tested in this experiment, 2 Sure Lock bowling balls and 2 Torrent bowling balls. Figure 8 shows the four different balls that were tested, the layouts on those balls, the migration paths, the top weight, and the after-drilling total weight. Looking at the data, Figure 9.1 is showing the ball paths of the two different Sure Locks as they were thrown down the lane. You'll notice at first glance that the blue line (5 x 2 x 2) sees the lane earlier. It was launched with slightly more angle and still didn't get as far right at the break point. The red line (5 x 6 x 2) stays on a straight line path longer, gets farther right, and recovers more down lane even though it was launched with slightly less angle. You can see that the true break point distance is a few feet farther down the lane for the red line compared to the blue line. Figure 9.2 is showing the ball paths of the two different Torrents as they were thrown down the lane. You'll see that there is nearly no difference in the two shots. They were released within ½ of a board of each other at the exact same launch angle and ended up within ½ of a board of each other at the pins with the overall shape being nearly exactly the same. All of these shots were kept within an extremely tight tolerance so that the difference you see in the plots is purely from the difference in the balls. Most will look at the graph and say, "Oh, they aren't that different." Looking closely at some of the data will show you some subtle front to back changes in ball motion. Reading your ball motion front to back is what separates the professionals from the amateurs. The primary reason for the difference between the Sure Lock and Torrent data is the PSA. You can really see how much influence the 0.018 of undrilled intermediate differential has on ball motion. Keep in mind that both of these Sure Locks are utilizing relatively "weak" PSA positions of 2" and 6". If I would've used a stronger PSA position, we would see an even bigger difference. You can see that the 5 x 2 x 2 Sure Lock sees the lane a few feet sooner. If you look at the Torrent data, you’ll see that the lines are overlapping. There is so little difference, it is not significant to the ball motion. The primary difference we see is caused by the difference in static weights. Might be a bit surprising to some that a ball with nearly 2 ounces of positive side weight reacts nearly identical to a ball with ½ an ounce of negative side weight. When throwing a 15lb bowling ball, there are approximately 240 ounces of total weight in the ball. 1 ounce of positive or negative side weight is not going to have a significant influence on the overall motion of the ball when there is such a large imbalanced core inside creating large flare patterns. The position of the core along with coverstock/surface preparation are going to have much more influence. For those of you who really want to get technical, Figure 9.3 is a swing sheet for each of the balls that were tested in this experiment. I'll highlight some of the major differences between the two. Look at the data from the Torrents. You'll see the RG on both is 2.56, the differential is 0.048, and the intermediate after drilling is relatively close. All of this information is why you don't see much difference in these two balls going down the lane. Go back to figure 8 and notice the migration paths of the two Torrents. The yellow dot on the right is the initial axis and the red dot on the left is the final axis the ball migrates to as it travels down the lane. You'll notice they go in exactly the same direction and flare the exact same amount. This is because after drilling, the PSA ends up in the thumb hole on both of the balls since there wasn't a strong PSA present to begin with. Since the PSA is in the exact same position on both of the drilled balls, along with the Pin-to-PAP distance and pin buffer, the balls are going to flare the exact same way. This really shows how insignificant static weights are to ball reaction in today's game. The 5 x 2 x 2 Torrent has 2 ounces of positive side weight, where the 5 x 6 x 2 has 3/8 of an ounce of negative side weight. You can see this has nearly no impact on the ball path in Figure 9.2. Now take a look at the Sure Locks. You'll see the RG on both is 2.49, but that's where the similarities end. You'll see the 5 x 2 x 2 has 0.056 differential and 0.019 intermediate, where the 5 x 6 x 2 has 0.060 differential and 0.025 intermediate. We have significantly changed some of these important numbers, which is why we see a slight difference in ball reaction. Keep in mind, both of these PSA positions tested are considered to be in a relatively "weak" position. If we split the difference and had a 3rd ball with a PSA-to-PAP distance of 4", we would see even more significant changes to the ball reaction. This was simply to show you how much earlier the PSA lines up with closer distances, and how much later it lines up with longer distances. Even in these relatively "weak" positions, they have more effect than any position does on a symmetrical. Now take a look at the migration paths of the two Sure Locks in Figure 8. You'll see when the PSA is pushed to the right, it forces the migration down. When the PSA is pushed to the left, it forces the migration up. This is because the migration path is always going to want to stay on the same RG plane that it began on. In other words, it's going to follow the path of least resistance. Since there is already a strongly defined PSA present on the Sure Locks, drilling a thumb hole doesn't pull the after-drilling PSA into the thumb hole. It will settle somewhere between the two. Think of it like a tug of war to get balanced. Intermediate differential is the force pulling one way and the mass taken out from drilling is pulling the other way. I've created one final image to help explain this. Figure 9.4 shows the after-drilling position of the PSA on the 5 x 2 x 2 Sure Lock. You'll see that the thumb pulled it away from its original position, but not all the way to the thumb as it did in the symmetrical. The intermediate differential from the PSA pulled it back and it settled between the two in a balanced position. The larger and deeper the holes are drilled, the more it will pull the after-drilling PSA towards them. Tying in with my article about balance holes, you can see how this after-drilling position of the PSA can be manipulated even more depending on the extra hole's distance from both the pin and the PSA. Asymmetrical bowling balls are truly unique in the amount of fine-tuning you can do to the reaction. This article was a bit difficult to keep light when the topic is more complicated. Reading over it more than once will definitely help you understand this complicated topic a bit more. I hope a few of you have made it to this point and feel like you learned something. Even if everything wasn't completely understood, hopefully it opened your eyes to the complexity of ball motion and how much really goes into it. If anything was unclear or you're looking for more information, please comment below or reach out to me directly. I'll do my best to help in any way I can. Learning more about the PSA and its effect on ball motion will significantly help you appreciate the difference an asymmetrical ball can give you. I’m sure most readers will find the test results comparing the symmetrical versus asymmetrical differences to be the biggest takeaway from this article. As I’ve said in previous articles, the laws of physics can’t be broken. Understanding more about what causes your ball to transition as it goes down the lane will make you a more powerful and versatile bowler in the long run. A smarter bowler can definitely beat a more talented bowler. Putting in some extra time to learn what is happening might just be the difference in your next match. Thanks for reading! A balance hole is an extra hole in the bowling ball that is not used for gripping purposes. 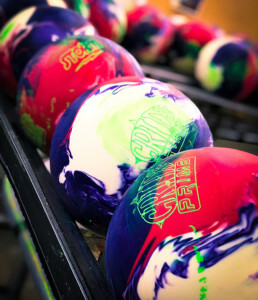 Balance holes are primarily used to make the ball static weight legal to the current USBC Equipment Specifications and Certifications Manual if they are outside the legal limit after drilling. Once a bowling ball has been drilled, there are still options to fine-tune the reaction for the bowler. This article is going to look at how balance holes can be used to alter the reaction of a bowling ball. Balance holes can influence ball reaction depending on the size and the location of the hole. Before reading this article, take a look at your current equipment. 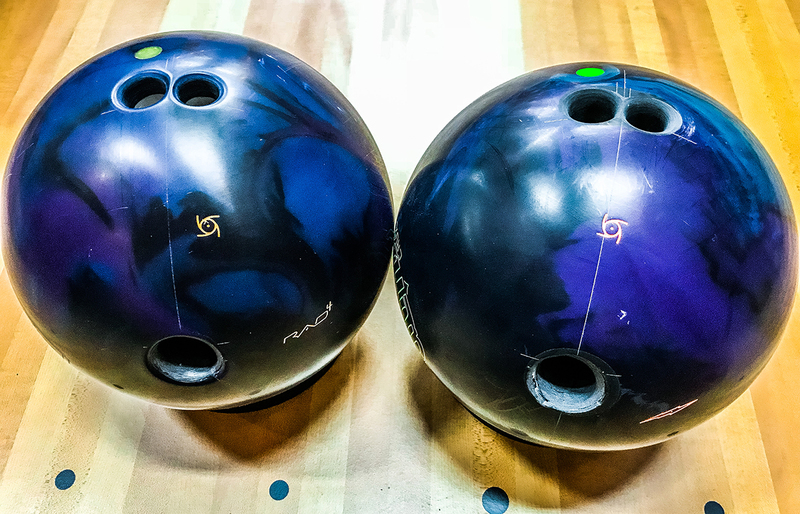 Do any of your bowling balls currently utilize a balance hole? If so, was there any thought put into the location of it, or was it simply to make the ball static weight legal? You may notice that you really like a ball with a certain location and size of balance hole, but it might not be your favorite on a different ball. Why is this? Let's examine. Traditionally, balance holes were presented in very simple terms. 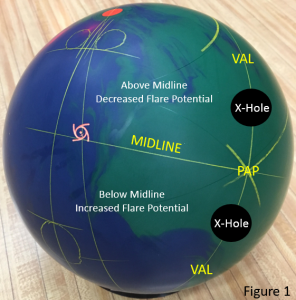 Historically, the higher the balance hole is in relation to the midline, the more it decreases the flare potential of the bowling ball. 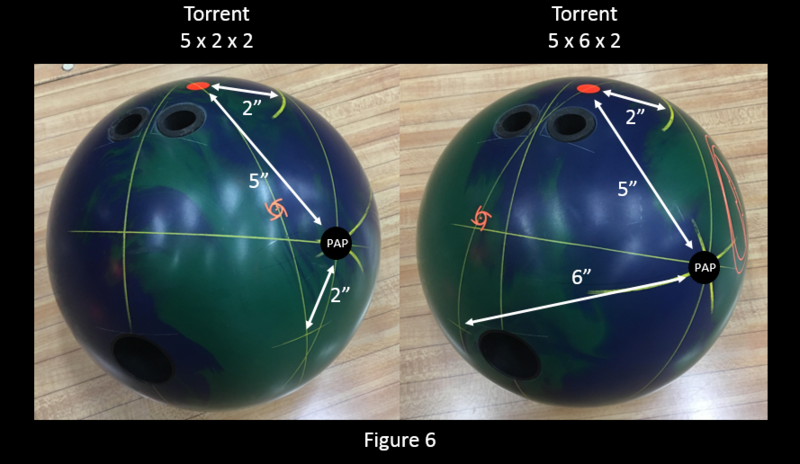 The lower the balance hole is in relation to the midline, the more it increases the flare potential of the bowling ball. Figure 1 illustrates this. While this is mostly true, there can definitely be some exceptions. Not all balance holes in the same location are going to have the same effect on the ball. There are other variables that are going to influence how they alter the bowling ball's performance. The term "RG" refers to the radius of gyration - a very important bowling term to become familiar with. This basically tells you how much of the mass is located towards the center of the ball. Low RG's means more of the mass is centrally located. Higher RG's mean that more of the mass is located away from the center. Lower RG balls are going to require less energy to change direction. They will transition faster and roll earlier. Higher RG balls require more energy to change direction. They will transition slower and roll later. Every ball is going to have both a low RG and high RG axis. Take a look at Figure 2. It's important to note that the pin is the surface designation for the low RG x-axis of the bowling ball. In general, 6 3/4" from the pin is going to be the high RG y-axis of the bowling ball. 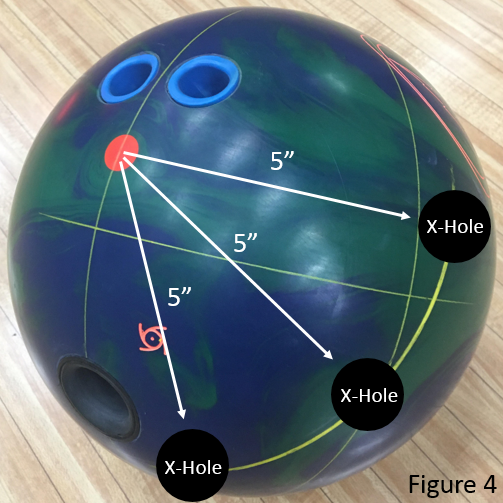 The distance from the x-axis to the balance hole is going to be crucial in determining how much and what kind of effect that the balance hole has on the reaction of the bowling ball. Shorter distances (3" or less) to the x-axis are going to decrease reaction. Longer distances (4" or more) to the x-axis are going to increase reaction. Distances somewhere in the middle are going to have little to no effect. Why does this occur? Let's take a look. Every hole that you introduce to a bowling ball is going to raise the RG of the ball in that particular location of the hole itself. We know that the pin designates the low RG axis on the entire ball. Figure 3 represents a 15lb Torrent. Looking at the numbers, a Torrent in this weight has a low RG of 2.56 and differential of 0.044. This means at the location of the pin, the RG of the bowling ball is going to be 2.56. If we go approximately 6 3/4" away from the x-axis, we will find the y-axis. The y-axis is the high RG axis of the bowling ball. This is essentially a 90° angle from the top to the side of the core. The difference between these two axes represent the total differential of the ball. Using some simple math, we can calculate what the high RG axis of an undrilled 15lb Torrent is. 2.56 (Low RG) + 0.044 (Differential) = 2.604 (High RG). It is important to note that the RG of the ball is going to change as we move across the surface of the ball. Somewhere in between 0 and 6 3/4", the RG will be somewhere between 2.56 and 2.604. The shape of the core primarily influences this. Now that we know the RG's of the Torrent, we can take a look at how balance holes are going to influence them. Let's start with hole placements with shorter distances from the x-axis. Imagine putting an extra hole directly through the pin as an extreme example. We know that introducing a hole into the ball is going to raise the RG of the ball in that particular spot. The x-axis is the lowest RG spot on the entire ball. If we add a hole to it, we are raising the RG of the lowest RG spot on the ball. This makes the lowest RG spot on the ball higher and closer to the high RG axis. This is lowering the total differential between the two, which makes the ball weaker and respond slower as it transitions down the lane. Think about where the mass is being taken out of the core. The pin is designating the top of the core. If we drill a hole directly through the pin, we are taking more mass out of the top of the core. This essentially makes the core shorter, which lowers the total differential and raises the overall RG. Now let's take a look at hole placements with longer distances from the x-axis. Imagine putting an extra hole 6 3/4" away from the x-axis. As always, when introducing a hole into the ball, that hole is going to raise the RG of the ball in that particular spot. Approximately 6 3/4" away from the x-axis is the high RG axis. If we put a hole on the high RG axis, we are raising the RG of the already high RG axis of the ball making it even higher. What is this going to do to the overall differential? The low RG axis remains unchanged, but now the high RG axis is even higher. The total differential has increased and the RG has remained lower. Imagine where the mass is being taken out of the core with the hole 6 3/4" from the pin. All of the mass will be removed from the side of the core. This is going to make it skinnier than it was before compared to its height. This will increase the total differential and keep the overall the RG lower. Finally, let's take a look at medium distances. If we put an extra hole at 3 3/8"away from the X-axis, we are precisely between both the low RG axis and high RG axis. This is going to have little effect because we are taking mass out at a 45° angle relative to each axis. We are taking mass out of the top and the side which cancels out the effect. If we get farther than the 3 3/8" distance, we remove more mass from the side. If we get closer than the 3 3/8" distance, we remove more mass from the top. Each of these effects have been outlined above and should make sense. Sizes are pretty self-explanatory. As you can imagine, the larger and deeper the hole, the more effect the hole will have on the reaction of the ball. This is because we are removing more mass out of the core. This means there are a lot of options when it comes to size and depth. I always suggest starting with a smaller hole because you can always increase the size based on what you see from the initial ball reaction. The final variable to look at is the position of the balance hole on the arc. Let's imagine that we put an extra hole in the ball 5" from the pin. There are many different positions on the ball that are 5". Looking at the Figure 4, we can place a balance hole anywhere on this arc and it will remain 5" from the pin. The further out we put the hole towards the VAL, the more we are going to smooth out and slow down the reaction. This happens because the holes are further apart. The closer we get the hole towards the thumb, the faster this ball is going to transition. This happens because the holes are closer together creating a larger intermediate differential after drilling. It is important to note that you always need to make sure that tracking issues won't occur when determining where to place the balance hole. You will always want to throw the ball first and make sure you aren't placing the balance hole near any track flare. Keep in mind, if you are using a flare increasing hole (4" or more), the ball is going to flare more after the hole is drilled. You will need to put the hole further away from the flare rings. Looking at balance holes like this makes it easier because it gives you consistency from ball to ball. The mass is being taken out of the same spot on the weight block to create a more consistent reaction regardless of the differences in layout. In Figure 5, the ball on the left is drilled 3 x 4 x 1 and the ball on the right is drilled 6 x 4 x 3. If both balls were to have a balance hole located on the PAP, the balance holes are not going to have the same effect on each of the balls. It's going to increase the total differential and lower the RG on the 6 x 4 x 3 ball because the balance hole is 6" from the pin. On the 3 x 4 x 1 ball, the balance hole is going to have less of an effect because it is drilled in the neutral zone of 3-4" from the pin. Keep in mind, all of this information is relative to all of the other pieces of the puzzle. Remember that Pin-to-PAP distance is going to be another variable influencing the reaction. Clearly a ball with a 6" pin-to-PAP distance is going to be cleaner through the front part of the lane and flare less. The location of the hole is one of the secondary factors that goes into ball reaction. The last thing we cannot ignore is the effect of hole placement on a symmetrical versus an asymmetrical core. Take a look at Figure 6. Remember that an asymmetrical ball can be fine-tuned even further because of the presence of the PSA, or the preferred spin axis. The closer the balance hole is drilled to the PSA, the higher the intermediate differential is going to become. The ball is going to transition faster because it has a higher intermediate split. The further the balance hole is drilled from the PSA, the more intermediate differential you are drilling out of the ball. Essentially, you are drilling out some of the asymmetry which makes it transition slower as a symmetrical ball would. All the other principals aforementioned are the same regarding balance hole distance from the x-axis. Essentially, if we put a 1 1/4" hole 6 3/4" away from the pin and drill it 3 1/2" deep, we are going to significantly increase the total differential and lower the RG of the ball. This is going to result in it transitioning much faster and hooking more front to back and right to left overall. If we put a 1 1/4" hole through the pin drilled 3 1/2" deep, we are going to significantly decrease the total differential and raise the RG of the ball. This is going to result in the ball transitioning much slower and hooking much less front to back and right to left. If we decrease the size or the depth of these holes, we will reduce the impact that they had in their respective locations. In summary, you can really see how much of an effect can be created using different balance hole locations and sizes. Hopefully now, you have a better understanding of how balance holes further from the x-axis increase flare potential and balance holes closer to the x-axis decrease flare potential. Keep in mind that there are many pieces to the puzzle that is laying out a bowling ball. Some are more influential than others. This article strictly looks at the effects of balance holes and keeps all other variables constant. Learning more about how these variables work together to create good ball reaction is crucial to understanding what your ball is doing as it transitions down the lane. Knowledge is power - put them all together and you've got some serious power. Always remember: not all balance holes are created equal! Knowing whether you need a symmetrical ball or an asymmetrical ball for the next piece of your arsenal is more important than you may think. Understanding the difference between the two can be a daunting task even for the seasoned professional, but once you have familiarized yourself with the main factors engineered into the ball construction process the sport becomes much clearer and adjustments become easier. Please keep in mind, however, that the information which follows may lead you to your nearest bottle of aspirin! It can be quite technical in nature, so don’t be alarmed if you need to re-read this article a few times before it starts to make sense. The term differential is the common nomenclature for the difference between the maximum and minimum RG values. The larger the number, the greater the flare potential becomes for the bowling ball. The radius of gyration, or RG as commonly known, is a measurement in inches from the axis of rotation at which the total mass of a body might be concentrated without changing its moment of inertia. Low RG balls rev up faster and more easily, creating more ball motion, or change of direction. 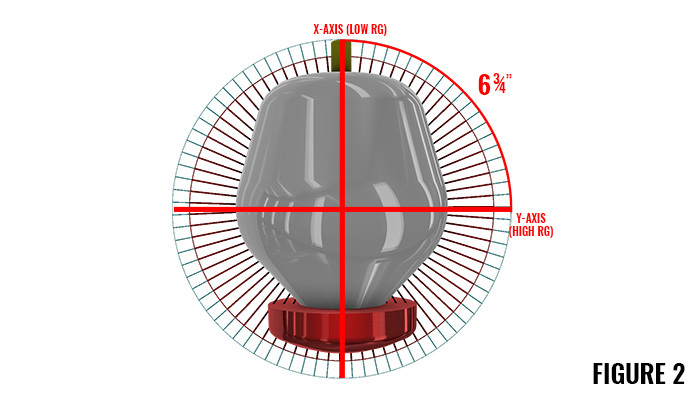 Total differential (flare potential) can be described as the difference between the X (low RG) and Y (high RG) axes of any bowling ball, symmetrical or asymmetrical. Intermediate differential is typically only expressed on asymmetrical balls and is the difference in the RG between Y (high RG) and Z (intermediate RG). Intermediate differentials exist on most symmetrical balls, but is not large enough to make a significant impact on the ball’s overall motion. Differential ratios mandate how asymmetrical a ball is and can be found by dividing the intermediate differential by the total differential. Balls with a larger ratio have a higher degree of asymmetry. Symmetrical balls have the lowest differential ratios in the industry. A symmetrical core has an RG (radius of gyration) values of the Y (high RG) and Z (intermediate RG) axes of the ball do not differ by more than 5% of the total differential of the ball. An asymmetrical core is a ball where the RG values of the Y and Z axes of the ball differ by more than 5%. It’s generally accepted that symmetrical drilled balls have a smooth, controllable motion. 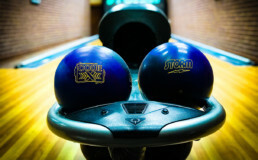 Asymmetrical balls have a defined, angular shape downlane that respond to friction quicker than symmetrical balls, given the same coverstock composition and preparation. All balls, symmetrical or asymmetrical, become asymmetrical after drilling. Simply put, asymmetrical cores are not in equal proportion top to bottom like a symmetrical core is. Asymmetrical balls can exhibit large amounts of track flare even with long pin-to-PAP (positive axis point) distances. A 6″ pin-to-PAP distance layout on a symmetrical ball will typically result in a very low-flaring ball. In a strong asymmetrical, however, a 6″ pin-to-PAP distance layout might result in a very high-flaring ball. This is the critical difference between symmetrical balls and asymmetrical balls. This leads to another interesting conclusion: asymmetrical balls can, in general, provide a ball driller with more reaction options than symmetrical balls. Symmetrical balls have only two ball motion "tuning parameters": pin-to-PAP distance and pin buffer. Asymmetrical balls add a third variable to the equation in the placement of the PSA (preferred spin axis) in relationship to the bowler’s PAP. The higher the undrilled intermediate differential is, the more significant the PSA position becomes. Bowlers who favor the use of an asymmetric core need a little extra help curving the ball. These balls rev up fast and finish strong with a more aggressive movement downlane. Asymmetrical balls are great for heavy amounts of oil or longer patterns which don’t provide a lot of friction while symmetrical balls are typically smoother and yield a benchmark type of reaction that are more controllable. Symmetricals have two principal moments of inertia (X and Y axes) and asymmetricals have three (X, Y, and Z.) This greater degree of asymmetry is responsible for the highly dynamic moves asymmetrical balls can create. And finally, don’t forget that there has to be a proper marriage between cover, core, and layout for the ball to react optimally, but we will save that for a later discussion. There are many variables that can affect the way your ball rolls. Some are related to the way you release it and your unique delivery. Other variables can be credited to that evil lane man and how he conditions the lane. Then there are factors that are above and beyond anyone’s control, and, no matter how hard you try, you cannot change them. We are going to discuss the subtle distinctions in how you roll the ball that play a bigger role than you might think. Understanding these characteristics will help you in choosing your next ball and, furthermore, help your pro shop operator decide a layout for your brand new toy. Did you know that your ball actually decelerates as it travels down the lane? The chemical composition in conjunction with the surface preparation of the coverstock matters greatly. A solid coverstock with a low grit surface texture will lose speed at a higher rate than a polished, pearlized coverstock. Friction reduces ball speed, so this actuality is highly linear with that of wood lanes or lanes that have not been oiled in a long time. In the published Ball Motion Study conducted by the United States Bowling Congress, the ideal bowling ball speed is about 17 miles per hour measured at impact with the pins and about 20-21 miles per hour when the ball is released onto the lanes. Bowlers with high ball speeds and without the revs to match can be considered “speed dominant.” They will typically favor more aggressive surfaces and layouts to help their ball pick up sooner on the lane. “Rev dominant” players with slower ball speeds typically like less aggressive balls, layouts, and surfaces to help prevent their ball from overreacting. Rev rate is a calculation of the amount of revolutions a bowler imparts on a ball. The common unit used is revolutions per minute, or RPM. Over the years, bowlers have generalized the RPM gamut into three categories: stroker, tweener, and cranker. Understanding your rev rate (and its relationship with your speed, axis tilt/rotation) is important because it helps to categorize your specific needs as a bowler. Knowing what type of ball to buy, what techniques need to be applied, or the type of wrist device needed all depend heavily on your rev rate. Axis tilt is the vertical angle at which the ball rotates. Commonly known as spin, axis tilt is determined by the position of the thumb during the release. If the hand turns too early, the thumb exits on top of the ball. Bowlers with a high degree of axis tilt will be able to see the top of their hand during the release and follow through. The resultant path of a ball with a higher degree of axis tilt is extended and the amount of backend potential is reduced. Oily lanes become quite difficult when the core is rotating in a vertical fashion, but is actually favored on drier lanes. Being able to have the thumb exit at the bottom of the forward swing minimizes axis tilt. The lower the axis tilts, the sooner the ball will enter its roll phase before making impact with the pins. Axis rotation is the horizontal measure of the angle of the ball's revolutions, and much like axis tilt, it is also determined by the bowler’s release. Axis rotation is commonly known today as side roll. When the ball has no axis rotation, the fingers exited directly underneath the ball at the 6 o’clock position. End-over-end roll (0° of axis rotation) removes all hook potential from the ball regardless of the amount of revolutions, speed, or lane conditions. High amounts of axis rotation (90° of rotation) will cause the ball to skid further, but unlike axis tilt, will cause an intense hook angle at the breakpoint. Players with high amounts of axis rotation will favor drier lanes, and lower amounts of axis rotation usually like more oil. Higher amounts of friction will cause the ball to lose axis rotation at higher rates. Initial axis rotation, ball speed, axis tilt, and lane friction all dictate when side revolutions become end-over-end revolutions. Generally speaking, balls skid, then hook, then roll. Less rotation will shorten the skid phase and get the ball into the hook phase earlier, while maximum rotation will extend the skid phase of the ball and increase its hook potential down lane. Manipulating your axis rotation is a valuable tool because it will change the ball’s reaction while still allowing you to stay in the same part of the lane and use the same break point. Ideally, you would like to limit lateral moves on the lane because it forces you to make multiple adjust­ments. And often, particularly on challenging conditions, the zone you’re going to have to play and the break point are pretty defined. Through practice, you can alter or enhance your ball speed, rev rate, axis tilt, and axis rotation. The best bowlers in the world have the ability to manipulate any and/or all of these at a moment’s notice. Technology of the sport today only enhances the subtleties of your game. Rubber balls and wooden surfaces did not place an emphasis on shot making versatility. Ball technology and oil patterns of the modern era force quick-changing conditions and different parts of the lane to be utilized that were not in play thirty years ago. Knowing your roll is more important now than ever before. 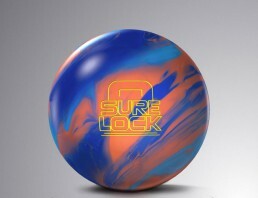 The Sure Lock is available now at a pro shop near you. This solid addition to the Lock family features a lot of continuation in a ball that is designed for heavier oil. The Sure Lock features the RAD-X Core and the GI-17 Solid Reactive Coverstock. It comes out of the box at 2000 grit factory finish. “If you’re looking for a ball that will read the midlane but still give you the continuation through the backends, the Sure Lock is the ball for you,” said Steve Kloempken. We’ve got a couple of ball reaction videos on our YouTube channel featuring Storm Staff Members, Darren Tang and Dan Higgins. 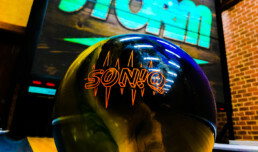 Be sure to head to our Storm Bowling channel to check them all out. Have you added the Sure Lock to your bag? Be sure to let us know what you think by reaching out to us on our social media channels or using the #StormNation. We can’t wait to hear what you think!